Pricing architectural photography with us works several different ways. 1) Mike Kelley is one of the TOP architectural photographers in America. His standard rate for 5 final images is likely several thousand dollars. However, he spends numerous hours shooting and editing those 5 images. If you would like us to spend a full day shooting or even multi-days and then spend 5+ hours per image editing, we can do that. But like Mike's prices, it will not be the lowest price around. So unless your budget is 3K+ for 5 to 10 images, you may want to explore our #2 and #3 far more affordable options that could be as low as a few hundred dollars depending on the scope of your project. 2) Our usual way of shooting architectural work for smaller projects of 5 to 10 final images is by typically spending 1 to 2 hours on site pending the scope of the project, then sending an image link sample with images that already have some editing completed and then after the final selections are made. we spend up to 45 minutes additional per final image making additional adjustments. So the on site time is a small part of the project because most of the time is in the editing. This is a hybrid option of #1 and #3 listed below and is actually the way most of the architectural work on our site was completed. This keeps cost down while providing a nice quality image that is suitable for print use. This type of project is typically quoted on PER image fee basis. For example, 10 final images is ___ per image which includes shooting and editing with additional editing being optional. 3) This option provides more images but is NOT as cheap as residential real estate photography which we don't do. For this option, we shoot lots of images, deliver a quick edited version for color and exposure and the project is complete. This option will yield more images than #2 above and is more suitable for a client that is looking for more images while trying to maximize their budget. The actual cost may be the same as #2 above, but this option simply yields more images with less editing time per image. We can also do additional edits on a per image request basis for an additional fee. 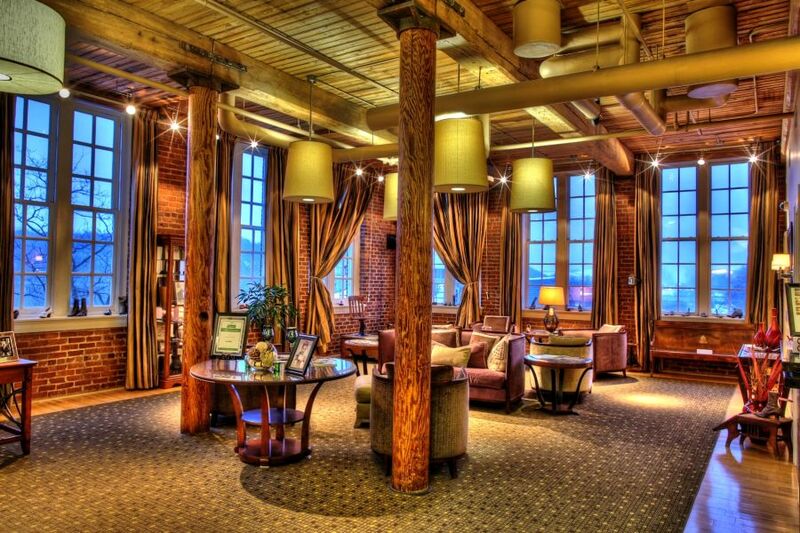 The still image above is of the lobby of the Craddock Terry Hotel in Lynchburg, Virginia. It is a blended image with an HDR twist to it. But the interior of the lobby is so vibrant that even without the HDR twist, it still makes for a great interior architectural image of a commercial property. As a full time commercial photographer, I photograph both people and shoot in other commercial related areas like products, architectural, interior and commercial real estate. Notice that I did not say residential real estate photography. Although I have photographed a home here and there, it's not my area of focus, but I do have a friend that is very good at it and competitively priced. I truly love the commercial (non-consumer) side of the photography image. I've been hired to photography commercial real estate for a developer as well as both interior and exterior work of hotels. Since I do corporate events, I've been able to get some nice architectural images of both the interior and exterior of numerous locations around the US including Quebec City Canada. After my upcoming trip to Palm Desert, California, I'm sure that I will have more architectural images of both the interior and exterior of the venue for conference that I'm covering. Architectural photography is different than people photography and to be honest, I photograph a lot more people than I do commercial real estate. However, I do truly enjoy photographing the interior and exterior of commercial properties. If you'd like to consider me for an upcoming commercial real estate photography project, please feel free to call me at 919.723.8453 or use the button below to start the quoting process.